Blizzard Beach is rated 4.5 out of 5.0, based on 437 reader surveys assessing its attractions. (See our Ratings and Research page for details.) Blizzard Beach is located at 1801 West Buena Vista Dr in Lake Buena Vista, FL. Its phone number is (407) 939-5277. Blizzard Beach is Disney's more exotic water-adventure park and, like Typhoon Lagoon, it arrived with its own legend. The story goes that an entrepreneur tried to open a ski resort in Florida during a particularly savage winter. Alas, the snow melted; the palm trees grew back; and all that remained of the ski resort was its alpine lodge, the ski lifts, and, of course, the mountain. Plunging off the mountain are ski slopes and bobsled runs transformed into waterslides. Visitors to Blizzard Beach catch the thaw—icicles drip and patches of snow remain. The melting snow has formed a lagoon (wave pool), which is fed by gushing mountain streams. Both Disney water parks are distinguished by their landscaping and the attention paid to executing their themes. As you enter Blizzard Beach, you face the mountain. Coming off the highest peak and bisecting the area at the mountain’s base are two long slides. To the left of the slides is the wave pool. To the right are the children’s swimming area and the ski lift. Surrounding the layout like a moat is a tranquil stream for floating in tubes. On either side of the highest peak are tube, raft, and body slides. 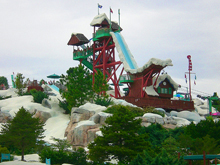 Including the two slides coming off the peak, Blizzard Beach has 19 slides. Among them is Summit Plummet, Disney World’s longest speed slide, which begins with a 120-foot free fall, and the Teamboat Springs 1,200-foot-long water-bobsled run. We’ve worn MagicBands at the water parks, and they’re pretty secure, but beware of anything in your pockets (cash, keys, etc.) that may come out on the slides. You should also watch for scrapes and bruises caused by the high-speed slides and the natural bumps formed by the partitions. We tend to wear a shirt to stop people from getting distracted by our amazing physique, but it helps on the slides too. For our money, the most exciting and interesting slides are the Slush Gusher and Teamboat Springs on the front right of the mountain, and Runoff Rapids on the back side of the mountain. Slush Gusher is an undulating speed slide that we consider as exciting as the more vertical Summit Plummet without being as bone-jarring. On Teamboat Springs, you ride in a raft that looks like a children’s round blow-up wading pool. Runoff Rapids is accessible from a path that winds around the far left bottom of the mountain. The rapids consist of three corkscrew tube slides, one of which is enclosed and dark. As at Teamboat Springs, you’ll go much faster on a two- or three-person tube than on a one-person tube. If you lean so that you enter curves high and come out low, you’ll really fly. Because we like to steer the tube and go fast, we much prefer the open slides (where we can see) to the dark, enclosed tube. We thought crashing through the pitch-dark tube felt disturbingly like being flushed down a toilet. The Snow Stormers’ mat slides on the front of the mountain are fun but not as fast or as interesting as Runoff Rapids or Downhill Double Dipper on the far left front. Toboggan Racers, at the front and center of the mountain, consists of eight parallel slides where riders are dispatched in heats to race to the bottom. The ride itself is no big deal, and the time needed to get everybody lined up ensures that you’ll wait extra long to ride. A faster, more exciting race venue can be found on the side-by-side slides of the undulating Downhill Double Dipper. Competitors here can reach speeds of up to 25 miles an hour. A ski lift carries guests to the mountaintop (you can also walk up), where they can choose from Summit Plummet, Slush Gusher, or Teamboat Springs. For all other slides at Blizzard Beach, the only way to reach the top is on foot. If you’re among the first in the park and don’t have to wait to ride, the ski lift is fun and provides a bird’s-eye view of the park. After riding once to satisfy your curiosity, however, you’re better off taking the stairs to the top. The following attractions have a minimum height restriction of 48 inches: Slush Gusher, Summit Plummet, and Downhill Double Dipper. The wave pool, called Melt-Away Bay, has gentle, bobbing waves. The float creek, Cross Country Creek, circles the park, passing through the mountain. The children’s areas, Tike’s Peak and Ski Patrol Training Camp, are creatively designed, nicely isolated, and—like the rest of the park—visually interesting. The layout of Blizzard Beach (and Typhoon Lagoon, described next) is a bit convoluted. With slides on both the front and back of the mountain, it isn’t always easy to find a path leading to where you want to go. At the ski resort’s now-converted base area are shops; counter- service food; restrooms; and tube, towel, and locker rentals. Blizzard Beach has its own parking lot but no lodging, though Disney’s All-Star and Coronado Springs resorts are almost within walking distance. Guests at Disney resort hotels can commute to the park aboard Disney buses. Because it’s novel and has popular slides, Blizzard Beach fills early during hotter months. To stake out a nice sunning spot and to enjoy the slides without long waits, arrive at least 20 minutes before the official opening time. When you're in the parks you need a game plan for each day. Our Touring Plans are step-by-step guides that save you hours of standing in line every day. We've got family-tested templates to start with, or you can customize any plan by adding attractions, meals, and breaks. Quickly flip through the attractions in Blizzard Beach, ranked by our experts and easily sortable by age group! Get a detailed overview of every full service and quick service restaurant, including ratings of quality, value, cost, as well as reader-survey responses. For full service restaurants, we list the setting and atmosphere, house specialties, our dish recommendations, and where to find the menus online.